Note: We talked to David-Lloyd a few weeks ago, before we'd actually seen "Children Of Earth," and he was deliberately quite vague about what happens with his character in this story. Ianto Jones started out as the most minor character in Torchwood — sort of a glorified butler — and grew rapidly in prominence. David-Lloyd says nobody was more surprised than he was to find that Ianto was becoming more crucial. "I'm not sure how it's happened," he says. "I thought I was going to die at the end of the first season. They worked the character to become more popular, and it started growing from there." He was "bowled over" when he saw the script for the episode "Cyberwoman" and found it was Ianto-centric, with a "wide range of emotions to play. It was great — very nervewracking, very rewarding." David-Lloyd says "Children Of Earth" definitely feels more like a widescreen thriller than a regular set of Torchwood episodes, "especially with the size of the special effects, and the time to set them up, it did feel like a movie." Plus the fact that they were doing one unified story across five episodes meant they were jumping back and forth between different episodes the whole time. It's got everything in it, actually. On one level, it's very much a science fiction show. But on another level, it's a very human drama - it's very domestic, almost soap-like drama, and [then there's] the huge sort of political drama that goes along with it as well. In the first two seasons, we often saw the Torchwood gang using closed-circuit cameras and the apparatus of the surveillance state to keep tabs on potential alien threats, and suddenly in the new series, the crew is on the run. That same surveillance state is turned against them. I asked David-Lloyd if it's weird to be suddenly on the other end. He said "absolutely," especially when they, sort of, at one, point actually resort to crime. It feels very different. Your knowledge of the way the apparatus works actually helps." Torchwood has been as evil as good, I think. There's always been a very delicate balance. You go back in time, and see Torchwood in Victorian times — they were quite ruthless and quite evil. They were put there originally by Queen Victoria, to defend the world against the Doctor. They were on the other side originally. There's always been that balance. Separate from the government, separate from the police — they were funded by the crown. And of course, Torchwood was originally meant to be a very jingoistic organzation, concerned only with British interests. It's only when you put someone like Captain Jack in charge, who's been to other planets and other times, that you start to see a larger perspective, says David-Lloyd. Speaking of Captain Jack, since the new miniseries features a new British prime minister, I was wondering if anyone mentions the fact that Captain Jack was nearby when the least two PMs were killed. (Harriet Jones and Harold Saxon, respectively.) But Jones says it doesn't come up — "That's quite interesting," he admitted. David-Lloyd wouldn't go into specifics about what happens between Jack and Ianto in the new series, but he did promise that their relationship doesn't get toned down for the bigger, more mainstream audience that watched "Children Of Earth" on BBC1. "I don't think the nature of the relationship gets toned down at all. If anything, it goes into the relationship more than it's done in the past... the sexual aspect is also definitely there as well — not graphically, but it's definitely there. It's more the love they have for each other, and how they can coexist, Jack being immortal." He's been very distant to his family, for obvious reasons — he 's part of a top secret organization. He's palmed hem off that he's a civil servant, and he's grown distant over the years. His father's passed aweay, his feelings are quite ambiguous. When Ianto shows up to visit his family, one of them says "Oh my God, is it Christmas?" And David-Lloyd says Jack used to be more emotionally cut off from everyone around him, after living so long and seeing everyone he loves die. 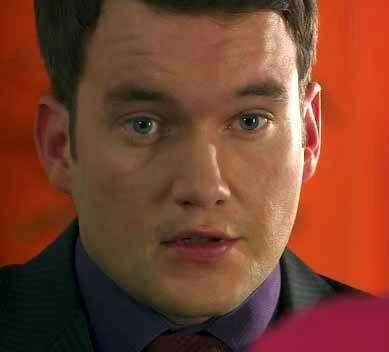 But both Ianto and Gwen have helped him open up again and given him more social skills. Gwen has "taught him the ways of the heart, and I think ianto has helped him be better with people in general. Jack always has a problem getting close to people. Everyone he loves, he has to watch die." So Ianto is probably the closest relationship Jack has had in a long, long time. Torchwood: "Children On Earth" starts tonight at 9 PM on BBC America, preceded by a one-hour Torchwood documentary at 8 PM.